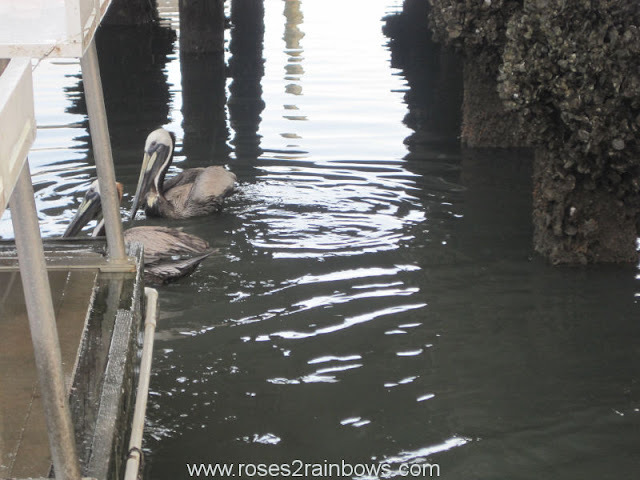 Here we have a couple of Pelicans hanging out looking for a handout. Fishermen were cleaning fish and tossing the remnants into the water. They are competing with a couple baby sharks for their lunch. Also present at this party was a sea turtle. 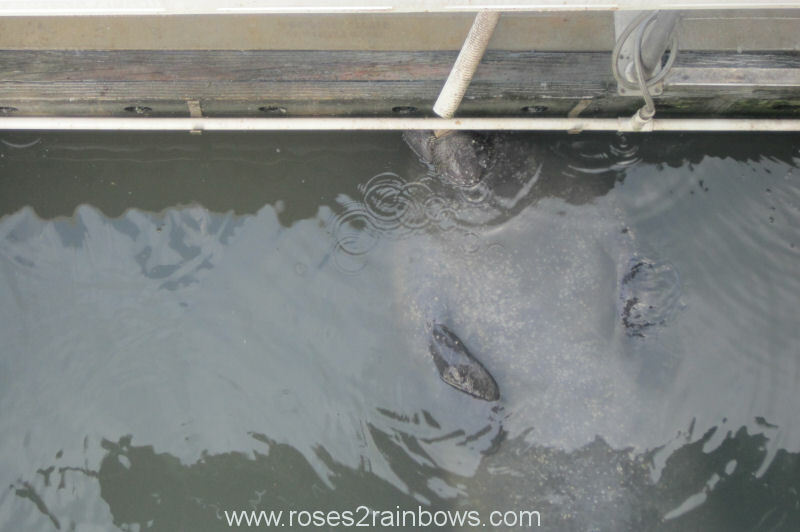 The star of the show, however, is the Manatee. Unfortunately these gentle giants are on the endangered species list. 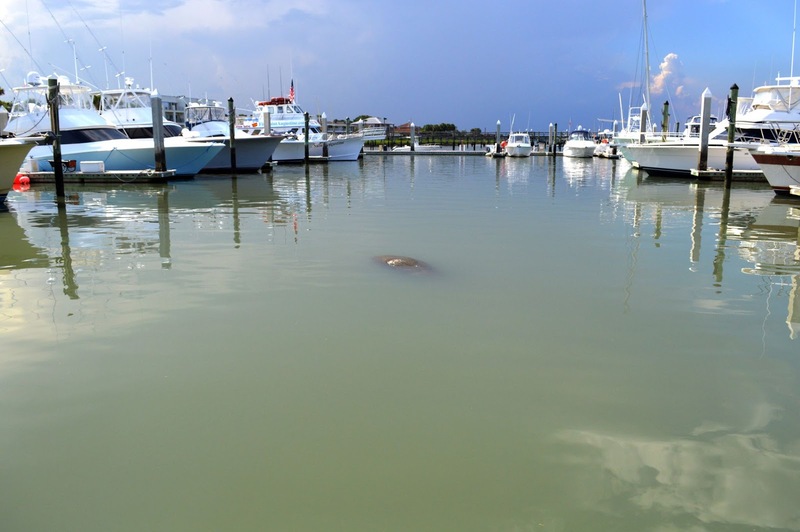 If you boat in areas where you may encounter manatees, please take a moment to read this. This manatee likes to hang out where he can get a fresh, cool drink of water. Here you can see his tongue and whiskers, and the algae and barnacles covering his tough skin. I turned up my pants and got down under one of the fish cleaning tables to get a closer look. The hose to the right of me is where the sink drains. Such a gentle creature for one so large. 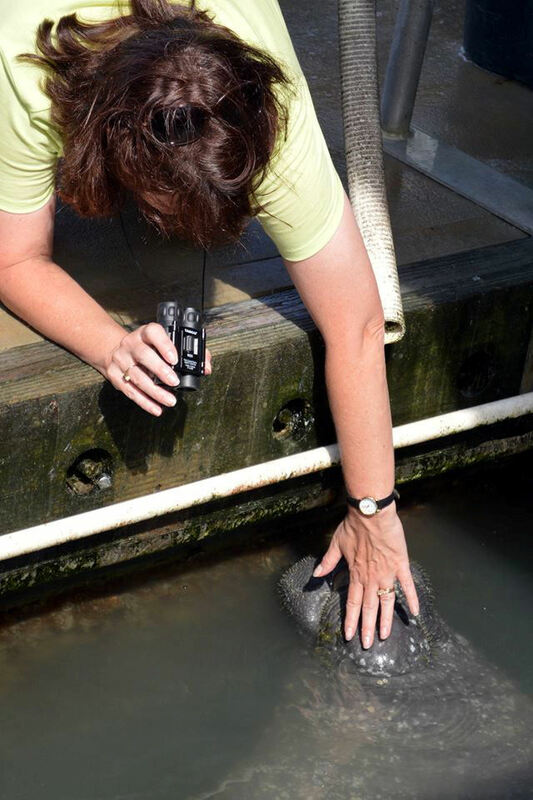 Yes, I petted the Manatee, and to answer one of the most asked questions, no he was not slimy. 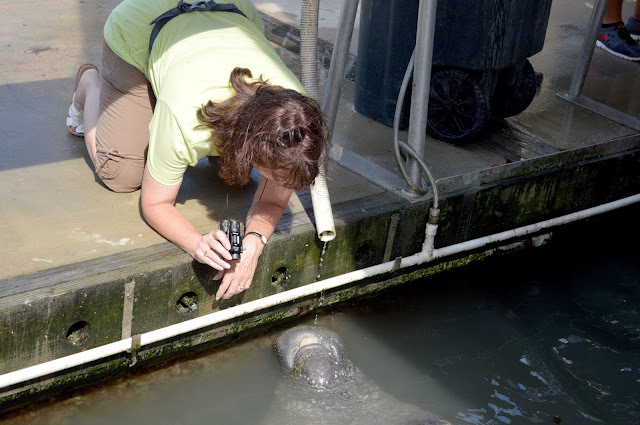 Although he might have been where the algae was growing. I felt the whiskers and they are like very thick hairs, flexible and not at all sharp. 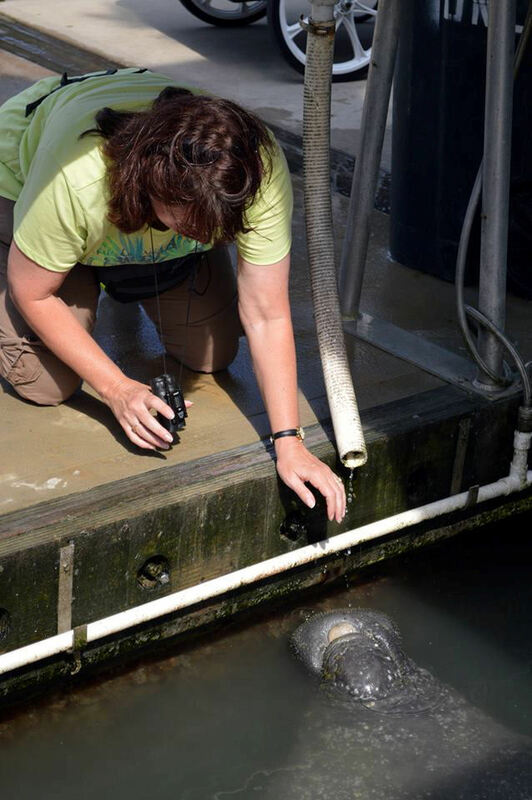 Bye-bye Mr. Manatee. It was an honor to meet you! I compiled the video we got so you can see how he interacted with people and how much he enjoyed the fresh water. They truly are magnificent creatures. Oh! That was so COOL:~) Lucky you. I can't believe how he came right up to you and let you touch him. Also, the video was great. I loved hearing the voices in the background. Some of them cracked me up. Funny to realize there were sharks nearby, even baby ones. Given the sharks, I was glad to see your buddy swim off. 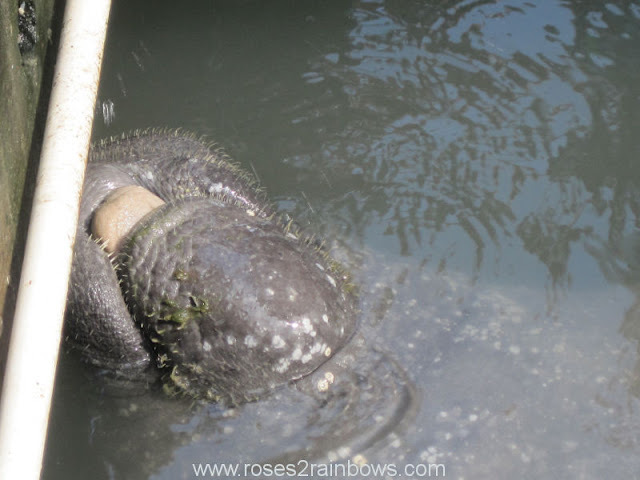 Thanks for coming by to check out my manatee adventure. I really had a blast that day. The manatee hung out there for quite a while enjoying the cool water. Given his size, I don't think he had anything to fear from the sharks - they were a foot, maybe a foot and half long. It was quite the salt water party there for a while. That was indeed a great experience and one of the real highlights of the trip. 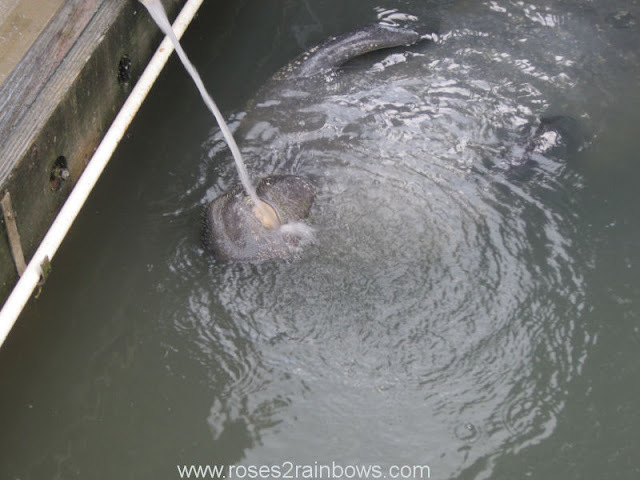 They are so large, yet so gentle and graceful, and he really seemed to be enjoying himself. So glad to see you back in the blogosphere!